B-Scan Tomey UD1000 - Ophthalmic Equipment and instruments for the professional of today. 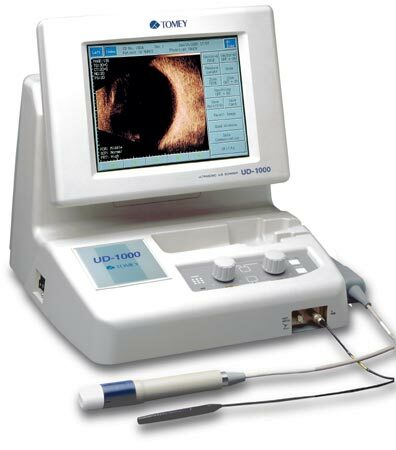 The B-Scan Tomey UD1000 incorporates the latest ultrasound technology for eyecare specialists. It is the ideal choice for the modern diagnostic laboratory. The UD-1000 provides B-Scan diagnosis, B-Scan axial length approximation and an optional A-Scan diagnostic function. The Dynamic Multi-Focus System scans near, middle and far points, compared to ordinary single focus systems that scan at one fixed distance providing only images of a single location. The B-Scan tomey UD1000 have a Multi-Focus probe delivers detailed images of all ocular locations (near, middle and far) at one time. The B-Scan Tomey UD1000 automatically saves up to the last 20 seconds of data acquisition as a video file. The images can be recalled individually or played back in video sequence. The images may also be printed using the optional video printer and/or transferred to a computer. Patient data and images can be stored on the optional Memory Card. The touch screen operation is quick and intuitive, allowing you to easily change parameters, select options, and switch between save and play back the video images. Even the distance and area measurements are only a single touch away! Are you done with the B-Scan Tomey UD1000? Go to B-Scan.